On day 3 of Taste Camp East, our group of bloggers had thinned slightly after the palate bashing during the first day and a half. But I was refreshed and excited to be heading over to the South Fork of Long Island to the Hampton’s appellation, yes THE Haaampton’s. We were making two stops on the South Fork, the first of which was Wolffer Estate Vineyard whose Estate Selection Merlots we had tasted during the first evening of Taste Camp. 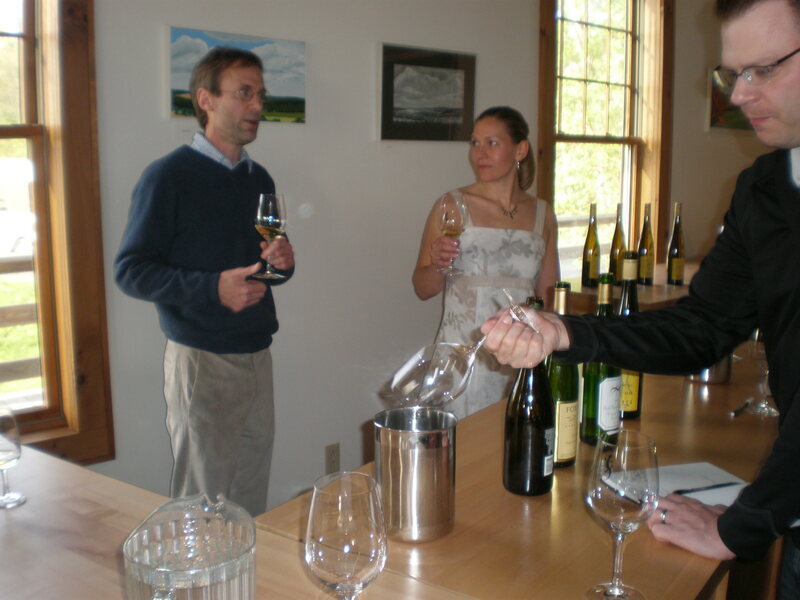 After meeting Roman Roth, the wine maker for Wolffer, he offered us a glass of there 2005 Estate Sparkling Blanc de Blanc to sip on as we waited for the rest of the Taste Campers to arrive. It was a nice and refreshing sip that awakened my palate quickly. 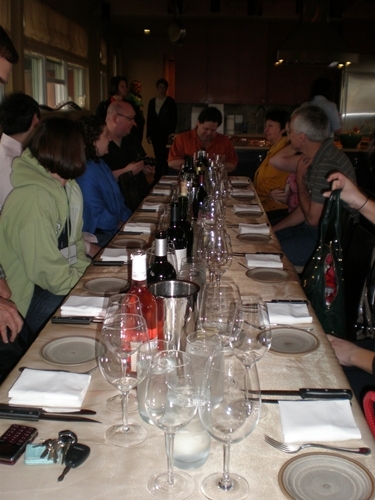 Once we were all accounted for, we were escorted to a private room for our wine tasting with Roman. mouthfeel: leathery and dusty, full big and spicy! Roman and the folks at Wolffer gave us the royal treatment, the same we had seen from our visits on the North Fork. Roman brought out the big guns for us, with these reds being in the $50 – $125 range but their Estate Selection Merlots are more in the $30 range and their La Ferme Martin line are all around the $15 price point. 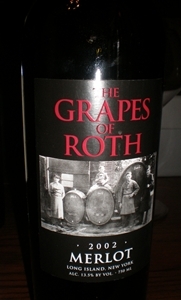 They were delicious though, my favorite being the 2004 Premier Cru and the 2000 Grapes of Roth. Both of which I bought and was lucky enough that Roman had a bottle of his 2000 with him as he usually doesn’t sell it from the Wolffer tasting room.. These Merlot’s showed the power and meatiness of California Syrah with the suppleness and elegance of Washington state Merlot, well at least that’s what my palate thought, and I dug it!! Thanks again to the folks at Wolffer and to Roman Roth, it was a treat and a pleasure. 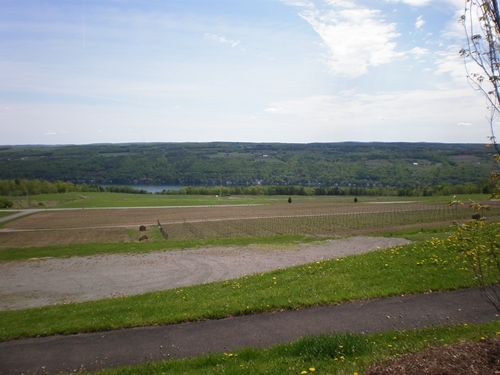 After leaving Paumanok Vineyards we headed over to Shinn Estates Vineyards for lunch and of course some wine tasting. Shinn Estates also doubles as a B&B and we ate in the dining room that separates the guest rooms and where the owners Barbara Shinn and David Page live. Prepared for us was a beautiful feast with quite a few vegetarian friendly items that I of course didn’t write down. But my friend and fellow Taste Camper Erika Strum put up the list of what we ate on her blog yesterday, so I snagged it. What we ate: rocket salad with a mustard-thyme vinaigrette, peconic bay calamari, piccolini pasta with asparagus, spring onion, lemon and fire-roasted shiitake mushrooms with ramps and fregula and crescent duck breast with sea salt, pepper and apricot-mustard sauce. To go with all this fabulous food we had 8 or so wines to pair with it all. 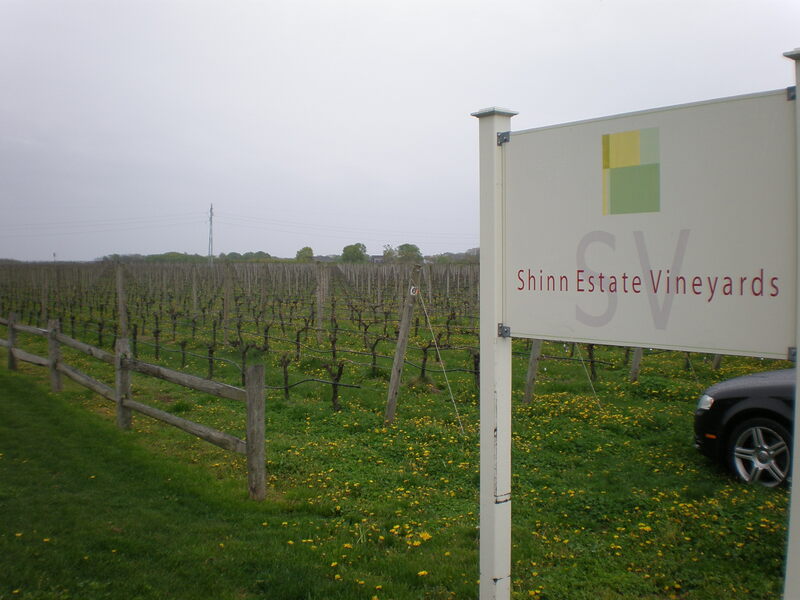 Providing the wines were of course Shinn Estates as well as Jamesport Vineyards and Macari Vineyards. 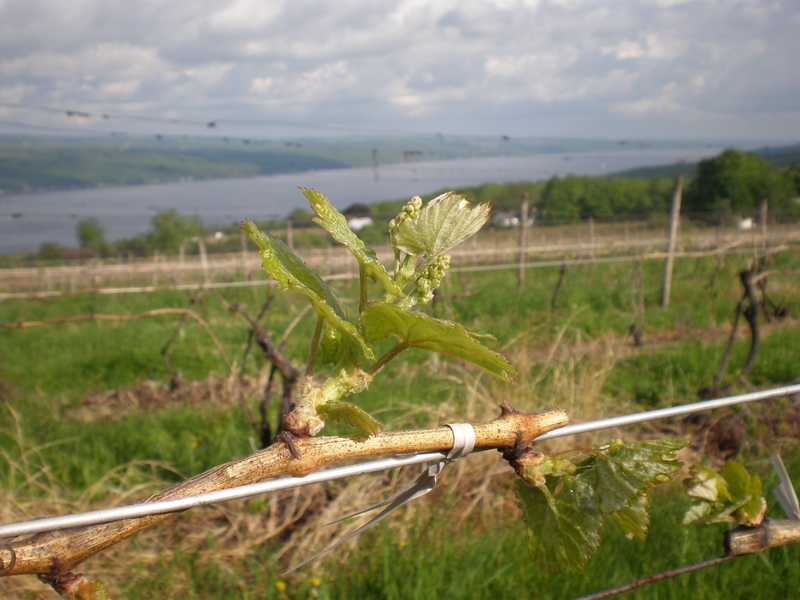 While we sipped and savored all the food and wine, wine makers from each of the estates gave us a good rundown of what they are all about, as well as their philosophies on sustainable viticulture. 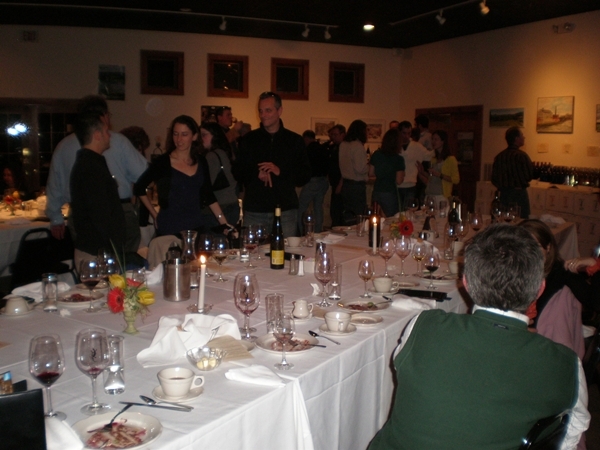 The wines are all very nice and the pairings worked out great with the delicious food. 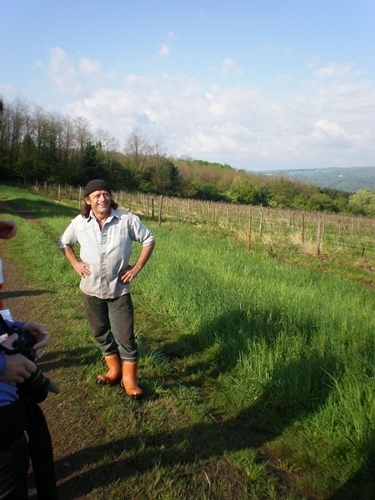 After lunch we headed out to the vineyard with David and Barbara to talk more about their vineyard practices. I wrote about it last week and put up a video here. Next up was a trade style tasting in the Shinn barrel room with quite a few Long Island wineries including Lieb Family Cellars, Sparkling Pointe, Croteaux Vineyards, Harbes, Bouke, and the The Old Field. 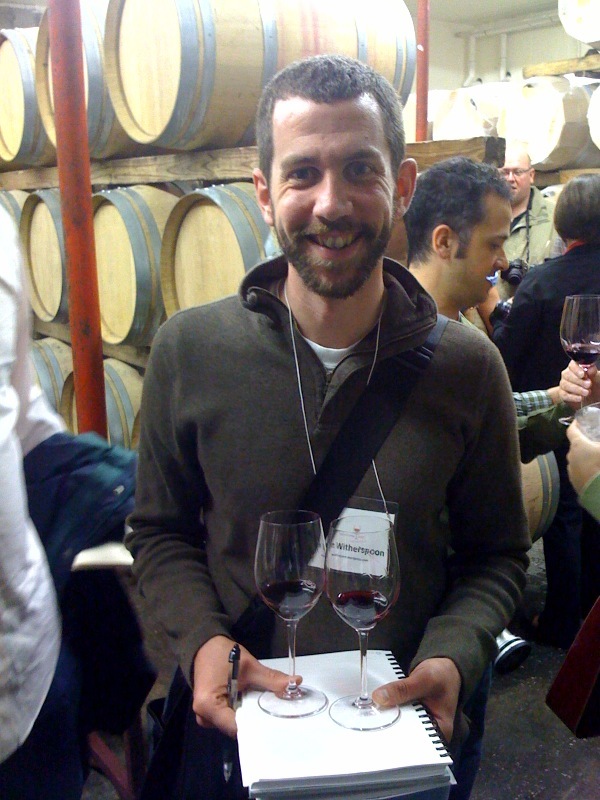 I was too diligent during this part of the tasting but did take a few notes here and there, and here are a couple of my highlights/legible notes! 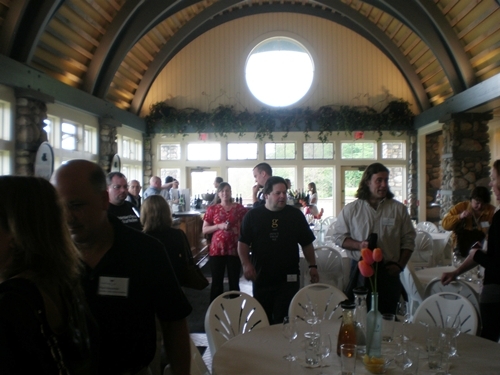 Thanks again to Shinn Estates for hosting us for lunch and to all the wineries that poured their wines for us. It was my pleasure. 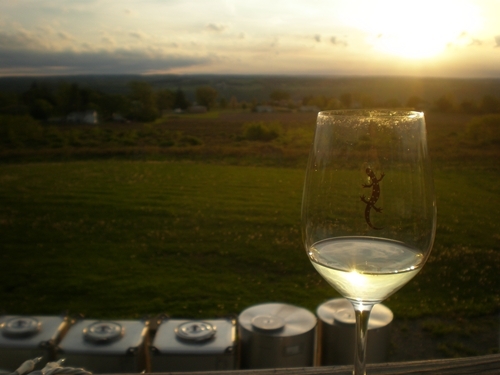 After leaving Roanoke Vineyards we headed to Paumanok Vineyards for a sampling of their wines. The tasting was more casual in style than the Roanoke tasting as we milled around in the tasting room as their wines were poured for us. 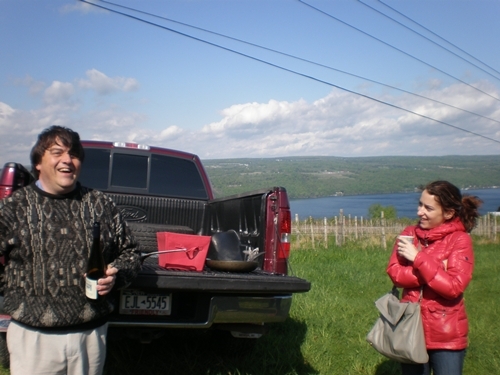 As the spitting commenced, and the wines were poured, each one was discussed in brief by either owner Charles Massoud or his son and now wine maker Kareem. After tasting through the wines in the tasting room, we headed down to the barrel room to taste some of the reds from the amazing 2007 vintage. The barrel tasting showed the depth of what the 2007 vintage will have to offer for Paumanok as these wines were big boys in the barrel. Barrel tasting is always a great experience especially when you can refer back to your notes down the road as you taste the wines again upon release. Although we tasted some great red wines, the high light and surprise of the day was the Chenin Blanc. 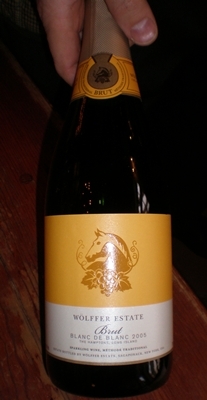 This was a fabulous wine and the one that we purchased from our visit to the winery. If this is an example of how well the Chenin Blanc grape can perform in Long Island, more wine makers should be working with it. Thanks to the Paumanok staff for a great tasting and second stop on our North Fork journey. 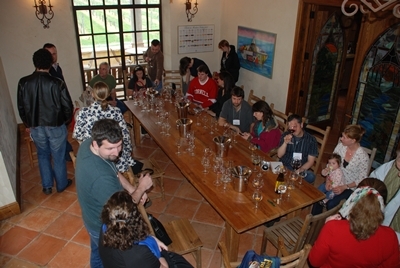 Tasting began “early” on day 2 of Taste Camp as we arrived, at Roanoke Vineyards at 10:00am. 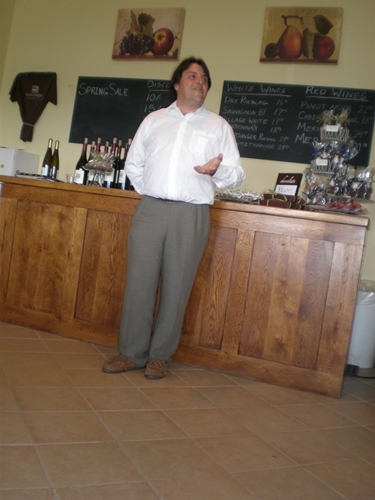 Greeting us was a beautiful private tasting setup and owner/vineyard manager Richard Pisacano. Check out Richard in the video below as he introduces us to his winery and how he got into the business. Of the 5 we tasted the ’05 Merlot and the ’06 Cabernet Franc were my favorites and I am wishing I had bought a bottle of each! Guess we will HAVE to plan a trip back North sometime soon. 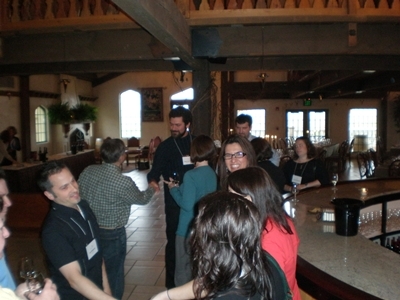 Thanks again to Richard and the Roanoke Vineyard staff for kicking off our Taste Camp Day 2 of tastings with a bang. After the first night of Taste Camp, I put up a quick post about the evening and mentioned one of my favorites of the evening the 2000 Wolffer Estate Selection Merlot. 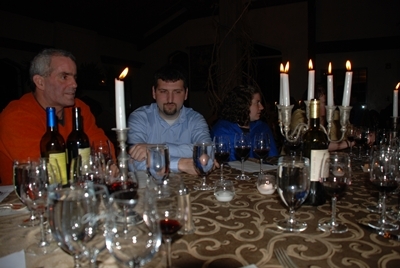 That Merlot was also poured during the great 5 course dinner that we enjoyed. As each of the wines were poured, representatives of the wineries got up and gave a quick rundown of what we had in our glasses. The wines poured for dinner and featured in the video were the 2006 Raphael Sauvignon Blanc, 2004 Clovis Point Merlot, 2000 Wolffer Estate Selection Merlot, 2004 Sherwood House Cabernet Franc, 1997 Pellegrini Vineyard Vintners Pride Merlot, Pellegrini Vineyard “Finale”. For some reason I didn’t have a video of Raphael talking about their Sauvignon Blanc so they aren’t featured in the video. 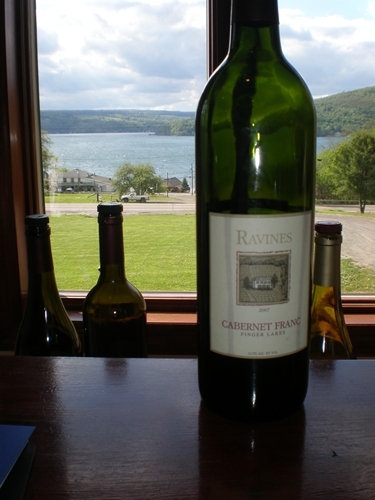 All of the wineries that are listed above, also provided verticals of several of their Merlots prior to starting dinner. Unfortunately I didn’t move quickly enough and didn’t get a chance to taste the Pellegrini Vineyards wine, except for at dinner. As well we were treated to tasting a vertical of the Merliance wines, from the Long Island Merlot Alliance. 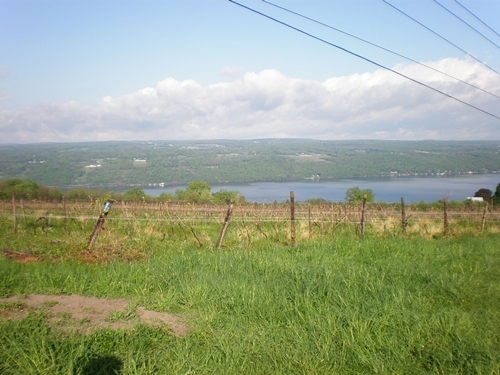 Merliance is a unique blend made of 100% Merlot varietal grown on Long Island and made exclusively by the members of the Long Island Merlot Alliance, all 5 of which were represented at Raphael and listed above. As mentioned earlier the 2000 Wolffer Merlot was my favorite on the evening but there were quite a few close runner-ups. Of the wines that I didn’t favor, I found similar “green”, stem like qualities with slight plastic and chemical off notes. This wasn’t held by one particular winery as these traits were seen across the board on the wines I didn’t like. As I said in yesterday’s post these are off notes that I find in wines that I don’t like here in Virginia as well. 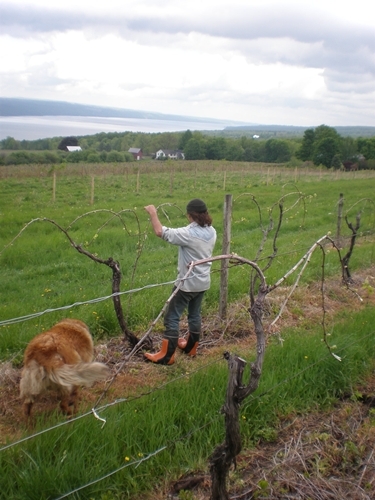 It would be interesting to do some sort of study to find out if there is a larger geographical terroir as the Virginia and Long Island landscape are so different. 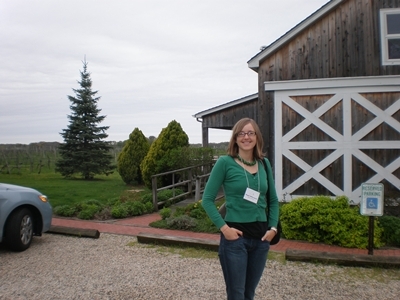 Check back soon for more notes on day 2 of our visit to wineries on the North Fork of Long Island. 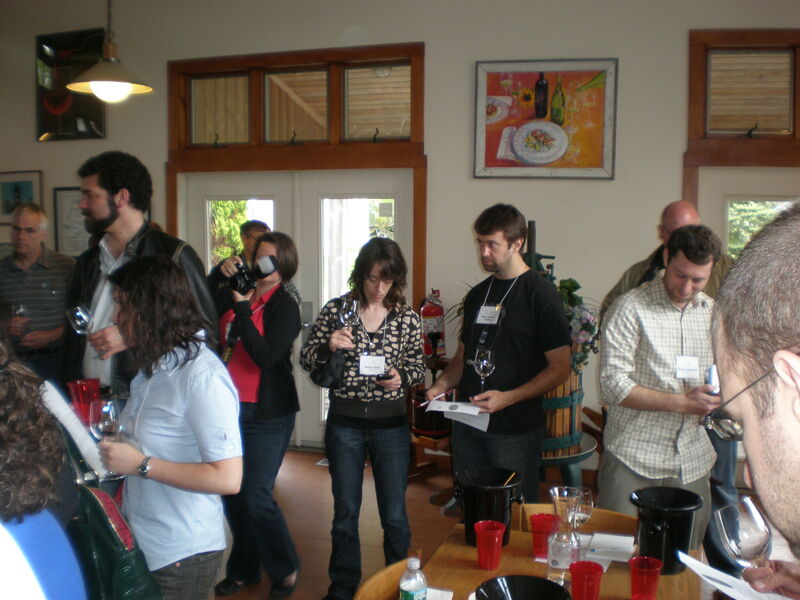 On day 2 of Taste Camp East 2009 (really the 1st full day) we had a flurry of tasting appointments that took us up and down the North Fork of Long Island. I will be updating the blogosphere with my dozens of pages of tasting notes in the days to come but I wanted to put up a quick video of Barbara and Dave from Shinn Estate Vineyards where we had lunch and tasted wines from many other surrounding vineyards. After lunch and before the “trade” style tasting in the Shinn barrel room, Dave and Barbara took us out to their vineyard and gave a great talk on their philosophy of biodynamic and sustainable viticulture. 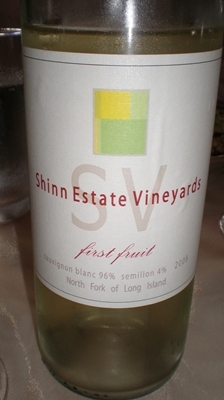 Check back soon for more of that I thought about the Shinn wines and others from day 2 of Taste Camp. 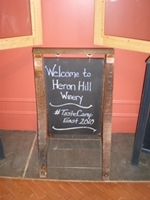 Last night was the first evening of Taste Camp and it was what seemed to be a great success. The dining room at Rapheal was a beautiful setting for the great dinner and wine service sponsored by both Rapheal Winery and the Long Island Merlot Alliance. Prior to dinner we had the opportunity to taste a slew of Merlot verticals from the various wineries that were in attendance. I think my favorite of the evening was the Wolffer Estate vertical that was highlighted (IMHO) by the 2000 vintage. Lots of blackberry and black currant on the nose, followed up by cedar, hay, raspberry and leather notes on the palate. I will be putting up more videos of each of the winemakers that spoke at last nights dinner as I get them cleaned up and edited.